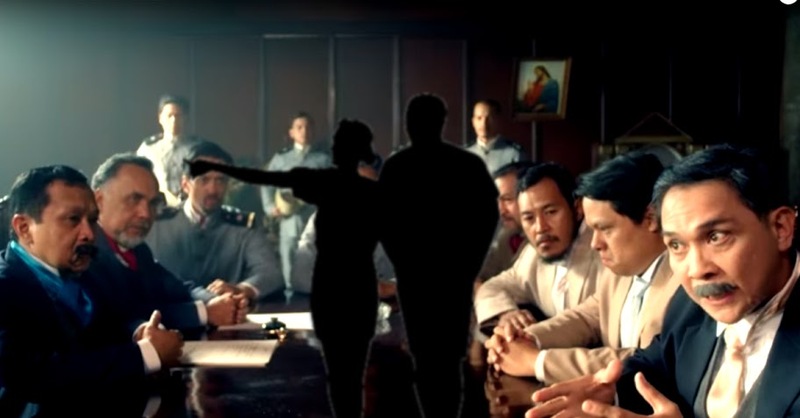 Image captured from the original Heneral Luna trailer on YouTube. If there is a movie that intrigues me enough to make me want to actually go to the movie houses here in Lipa, I always make it a point to go see the day’s first showing. First of all, I get to choose the houses’ best seats. More than this, the majority of moviegoers prefer to go later in the day. Thus, there are less people to get annoyed with. Unfortunately, Heneral Luna which I went to see earlier this week had a 12 noon first showing. This and the fact that interest in the movie was being boosted by social media meant that attendance for the day’s first showing was heavier than what I was accustomed to. Although all the movie houses at SM Lipa have what traditionally used to be called the “Orchestra” and “Balcony” sections, these days ticketing is single-priced and no longer segregates moviegoers. That day when I went to see Heneral Luna, although the lower section had seats galore, everyone still wanted to be seated at the upper level. Thus, I was witness to some really horrifying behaviour people should really not bring to the movie houses. Before I proceed, I just wish to make it clear that this article in no way attempts to denigrate the citizens of Lipa, as indeed I myself am one. The city is central enough in its location and close enough to many other cities and municipalities so that boorish behaviour I observe every now and again may be by people not even from the city. In my youth, we almost instinctively knew no matter how boisterous we were outside the movie house that we had to move like mice – i.e. quietly – and speak in whispers once inside it. It was just respect for those already inside. I could not help but frown at the group of college co-eds one row behind from where I sat. They were giggling when they came in and continued to giggle while the trailers were being shown. One even announced to everyone within hearing distance that she had no intention of going to class in the afternoon. To be fair, they shut up once the movie got going; but would giggle whenever Paolo Avelino had a scene. “Si Paolo!” Thank God Avelino only had a supporting role in the movie! Then there were these two elderly women who came after the movie had started, stood in the aisle in front of me and almost completely obscured my view. One nanay faced to the left and stooped to inspect the row of seats with her apparently poor eyesight; changed direction and did exactly the same. I half expected her to do a twerk-it-like-nanay; and to be honest I was more amused than annoyed. I mean, there the two were blocking everyone’s view and completely oblivious about it, as though they were inside their own living room. One even started to sit down on the stairs until the other one yanked her back up shouting, “Ayown!” And the two nanays were off. It was comical, but inside my head I wondered what bukir the two came from and if the bukir was abot na ng Coke and Colgate. In the old days, upon entering the movie house, one respectfully stayed behind the rows of seats until one’s eyes adjusted to the dark. Then one waited for a daylight scene in the movie so that the empty seats were easier to spot; and hurried quietly to the seat before another dark scene came on. These days, many moviegoers have cell phones with flashlight apps; and use these indiscriminately inside the movie house. It is shocking that those who do this do not seem to realise how almost painful it is for those whose eyes have already adjusted to the dark to suddenly have bright light pointed at them. To be fair, those who did this in the Heneral Luna crowd I was in pointed their flashlights downwards. Not that this made a hell of a lot of difference because some of the flashlights were really bright and still intrusive even when pointed downwards. Okay, the coughers when I watched Heneral Luna were thankfully far from where I sat. It is not the coughing per se that I find annoying because I can focus on a movie enough to be almost oblivious of someone coughing. What I find annoying is when coughers do not seem to be aware or worse, do not seem to care, that they are expunging gazillions of germs into the air-conditioned confines of the movie house. There was this one time not too far back when I got up and moved to another seat because the guy behind me was coughing laboriously. Por Dios! How difficult is it to get your hanky and cover your mouth when you have to cough? Those of my generation will recall how much we rejoiced when the twin cinema Diamond and Jubilee first opened in the mid-seventies, Lipa’s first air-conditioned movie houses with folding upholstered seats to boot. The Diamond and Jubilee was probably generations ahead of its time and offered a fine alternative to the hot and bedbug infested other movie houses in the city. Before long, some moviegoers were slashing and ripping up the upholstery, the sort of vandalism that one did not see in movie houses in Metro Manila. Thankfully, the community has become sophisticated enough to not stoop to that sort of movie-going behaviour; but there are still other things that people should really not be doing in movie houses.